This Burgess: Album Review: Bob Dylan - "Christmas in the Heart"
Album Review: Bob Dylan - "Christmas in the Heart"
I've been watching for the Bob Dylan Christmas album pretty much since I heard about it. That was several months ago and just last week I finally got to hear it. "Christmas in the Heart" is a solid album. It really couldn't have been anything else. The set-up was so good the execution hardly mattered. Dylan's grizzled voice is boosted by his expansive backing band. It's like the town drunk found the most expensive karaoke machine in existence and warbled your favorite holiday tunes. Dylan has also safeguarded himself against calls of being some sort of sell-out (a subject I'm sure he'd rather avoid after the "goes electric" kerfuffle.) Watch and learn. Feeding America will receive Dylan's royalties from sales in the USA, while two further charities, the United Nations' World Food Programme and Crisis in the UK, will receive royalties from overseas sales. Dylan said: "That the problem of hunger is ultimately solvable means we must each do what we can to help feed those who are suffering and support efforts to find long-term solutions. I'm honoured to partner with the World Food Programme and Crisis in their fight against hunger and homelessness." A stroke of genius. It's almost as if it should come with a label that reads: "Sitting in judgment of this album is like sitting in judgment of starving people. Shame on you. (Let's listen to Mr. Zimmerman play his songs.)" Speaking of which, for a Jewish man I certainly haven't heard any Hanukkah songs come out yet. He has previously done dabbled in Christianity before on the albums "Slow Training Coming" (1979), "Saved" (1980) and "Shot of Love" (1981). Perhaps he hasn't completely given up on these concepts. If he at least got behind what we was singing about the whole concept would be boosted several times over. 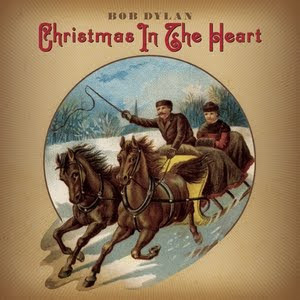 Bob Dylan - "Must Be Santa"
Bob Dylan - "Little Drummer Boy"
There is no excuse for not hearing this album.